From $598 per adult twin share. Cruise on the upper stretches of the Zambezi River where David Livingstone canoed on his quest to discover the falls over 150 years ago. Spend three magnificent days exploring this legendary African icon and experiencing the scenic beauty of the area. 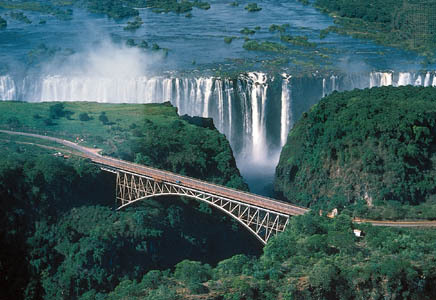 It is known as ‘Mosi-oa-Tunya’ by the locals which translates as ‘The Smoke That Thunders’. We are delighted that we are now able to offer greater flexibility on our Victoria Falls packages with daily departures on request as well as 2 or 3 night packages. Come with us and experience this natural wonder. On arrival, you are met by your Thompsons Africa representative and transferred to your hotel. The hotel is created in the style of an ancient African city and is centrally located to all the amenities of Victoria Falls town. In the afternoon cruise on the upper stretches of the Zambezi River where David Livingstone canoed on his quest to discover the falls over 150 years ago. Enjoy viewing the abundant wildlife and incredible variety of birds while a mesmerizing Zambezi sunset will leave you breathless. This morning we visit a secluded and unexplored Zimbabwean Village where you may speak with a Traditional medicine healer and witness age old customs and ways of life. Afterwards we enjoy a guided tour of the Victoria Falls stopping at various vantage points to view the falls and walk through the rain forest. Seeing the rainbows, feeling the spray and hearing the thundering noise of water crashing down into the 108 meter gorge serves as a testimony to the awesome power of the mighty river. The remainder of your afternoon is spent at leisure, where you can enjoy one of the many optional activities available (own account). * NOTE: September to January is the dry season.